Reefs in their many forms are found throughout the fossil record and represent some of the earliest structure-forming ecosystems on Earth. Since the explosion of metazoans in the Cambrian around 540 My (million years ago) many groups of organisms have formed 'reef like' features on the sea floor, making reef communities difficult to singularly characterise. Following the greatest extinction of all time, the Permo-Triassic event (251 My), scleractinian corals, bivalve molluscs, and crustose coralline algae have dominated the construction of wave resistant organic carbonate structures on the planet—commonly called reefs. While the definition of just what is a 'reef' has a long and tortuous history of debate in the scientific literature, there is no dispute about the importance of the reef ecosystems of the coastlines, continental shelves and ocean provinces of the tropical realm. In this chapter we take a broad spatial and temporal view of the largest of the world's platform reef provinces—the Great Barrier Reef (GBR). In particular we look at the boundary conditions and mechanisms that underpin the perpetuation of the GBR province in space and time and how environmental change has influenced the reef biota. The last decade has seen an increasing appreciation of the importance of understanding the GBR from a total system perspective. It has also seen the recognition of the need for a temporal perspective in every aspect of ecology, especially where it seeks to relate to natural resource management. Understanding the ecosystems we live in and exploit over medium term time scales allows natural resource managers to plan for ecological resilience that is key to sustainability. But what about the long term view? Geological evidence accumulated over the last 30 years shows that the 'reef' part of the GBR is a relatively young feature—less than 1 million years old. Because reefs are built mainly during rising sea levels, and the highest sea levels are associated with interglacial periods, much of our attention is attracted towards GBR reef growth during the interglacial high sea level episodes of the last 500 000 years. But the GBR, like reefs elsewhere in the tropics, survived during lower sea level stands as well. In this chapter we explore the life and times of the GBR and the dynamic ecological response of coral reefs to constant environmental change. The history of the GBR is influenced by the post-Gondwanan continental drift history of the Australian continent and repeated episodes of global environmental change associated with the late Tertiary and Pleistocene ice ages. The 'reefal' GBR is a relatively young geological structure that was slow to respond to favourable environmental conditions early on. In fact, the central Queensland continental shelf has enjoyed warm tropical waters that could well have supported coral growth for the past 15 million years (My). However, the best evidence indicates that the initiation of the GBR did not occur until around 600 thousand years ago (ka), and the regional province of reef systems as we now know them probably did not occur until around 365-452 ka. This is coincident with Marine Isotope Stage (MIS) 11, perhaps the warmest interglacial of the past 450 thousand years (ky), and one with climatic conditions most similar to those we are now experiencing. Some workers believe that the 'switching-on' of the GBR was related to the mid-Pleistocene transition from 41 ky to 100 ky-long climatic cycles, and to the development during MIS 11 of a marked highstand that enabled sustenance of both a cyclone corridor and a reef tract along a relatively wide and deeper water continental shelf (Fig. 3.1A). Cores drilled through Ribbon Reef 5 have shown that the GBR has been able to reestablish itself repeatedly during high sea level episodes associated with major environmental fluctuations in sea level, temperature and CO2 over the past several hundred thousand years. 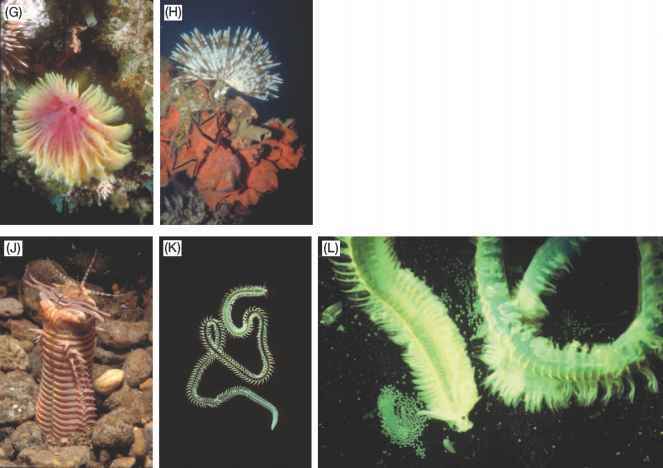 Moreover, these reefs have maintained a similar coral and algal species composition during their repeated formation (see section on Palaeoecology below) (Fig. 3.1B, C). The growth and decay of ice sheets in the northern hemisphere were controlled by 104- to 105-year scale climate changes forced by natural cyclic changes in several parameters of Earth's orbit (so called Milankovitch cycles). These cycles influence the amount of sun energy received by the Earth. They include obliquity (changes in the angle of Earth's axis of rotation with respect to the sun), eccentricity (changes in the circularity of Earth's orbit around the sun), and precession of the equinoxes (changes in the position of the Earth in its orbit around the sun at the time of the equinox). The cycles are 41 000, 100 000, and 23 000 years respectively. During the last 500 000 years, global sea level underwent at least 17 such cycles of rise and fall. Average rates of sea level change between glacial and interglacial intervals approached 5 m per thousand years with the possibility of greater rates associated with Heinrich events (abrupt climatic episodes associated with ice-rafted detritus during the last glacial). The magnitude of sea level change from one interglacial to the next is on the order of 120 m, a major repetitive 100 m+ rhythm to the late Pleistocene ice ages with which all marine life contends (Fig. 3.2A). The GBR is very similar to other reefs around the world in having grown during rises in sea level, or transgressions, associated with the deglaciation part of the cycle. One of the best examples of transgressive reef growth that has been clearly related to the oxygen isotope record for the late Pleistocene occurs at the Huon Peninsula, Papua New Guinea (PNG) (Fig. 3.2B, C). In this remarkable tectonically active locality, ongoing uplift during the last several hundred thousand years has left a record of transgressive reef terraces like 'bath rings' along over 80 km of coast. Here, nine transgressive reef growth phases are recorded between 125 ka and 30 ka. Overall the record of dated transgressive reef growth episodes extends back to at least 340 ka. During rising seas, reefs can accumulate at rates exceeding 10 m per thousand years. This involves a huge bulk of cemented biological framework, principally coral and coralline algae, and even larger quantities of associated sediments. However, once reefs reach sea level, or sea level rise slows and stabilises, this growth slows. From here the interplay between the growth of the bound biological framework, the production of reef associated skeletal sediment and their destruction by bioerosion and physical forces becomes of critical importance to the maintenance of reef growth. The geology, geomorphology and age structure of the GBR is described in detail in Chapter 2. While there is evidence of Pleistocene age reef growth older than 140 ka, we will focus on what the more recent evidence can tell us about the GBR ecosystem in time and space. Here we discuss the GBR during its most recent 'life cycle'—from the previous to the current interglacial cycle and spanning the last ice age. Holocene transgression from the Last Glacial Maximum (18 ka) to the current high sea level stand. There is also radiometric evidence from the GBR that the Holocene reef growth was superimposed upon relic Pleistocene reef topography from the last interglacial age. In other tectonically stable parts of the world this last interglacial reef is well documented at about +2-6 m a.s.l. For example, the last interglacial reef (125 ka, ~5 m a.s.l.) is emergent along the West Australian Ningaloo coast, where it is extensively preserved in near desert conditions (Fig. 3.2 D). Whereas the north Queensland coast is well endowed with evidence of Pleistocene shorelines in the form of beach rock, dunes, dune foundations, and beach ridges (e.g. Cowley beach near Innis-fail), there are relatively few occurrences providing surficial expression of last interglacial reef framework from the GBR (e.g. Stradbroke Island, Evan's Head, Lord Howe Island, Saibai Island in the Torres Strait, Digby Island). One possible explanation for this is that the northeast coast's moist airflow from onshore tradewinds has weathered and eroded the emergent 125 ka GBR reef below the current high sea level such that they now only exist as a base for Holocene reef growth. But perhaps the last interglacial reef did not everywhere grow to the high sea level. One recent explanation is that vertical movements in the form of hydro-isostasy or tectonic lowering are the major factors. Because of the Milankovitch cycles discussed earlier, sea level fluctuations are not confined to 'glacial' (i.e. Last Glacial Maximum [LGM] 18 ka) and 'interglacial' (i.e. Last Interglacial [LI] 125 ka) periods; smaller scale fluctuations are referred to as 'stadial' (temporary ice advance) and 'interstadial' (temporary ice retreat) times. Abundant studies carried out in tropical seas correlate the growth of 'wave resistant organic structures' such as coral reefs with sea level transgressions. We therefore might expect to see transgressive reef deposits developed during the smaller scale sea level changes between the high stand LI and the low stand LGM (Fig. 3.2C). But is there any evidence for GBR reef-building during these lower sea levels? The nature of low sea-stand reefs has been studied in the Huon Gulf in Papua New Guinea. Here are found similar rates of accumulations and coral communities that were not unlike their high sea level stand counterparts in the adjacent raised reef terraces of the Huon Peninsula, PNG. Regardless, reefs must be seen as dynamic and fluid, reacting to sea level throughout the major and minor Pleistocene fluctuations in sea level (Fig. 3.2A). On the GBR, there is a history of investigation of the terraces and positive-relief features on the continental shelf and margin for evidence of lower sea levels. 'Wave-cut' terraces have been recorded in the southern GBR at —175 m and in the central GBR at —113 m, -88 m and -75 m, where they were interpreted to correspond to postglacial shorelines. Submerged reefs, terraces and notches have been consistently recorded on single beam echo sounder transects across the southern GBR shelf edge but so far there is insufficient evidence on the spatial distribution of these features to make accurate comparisons against sea level curves. 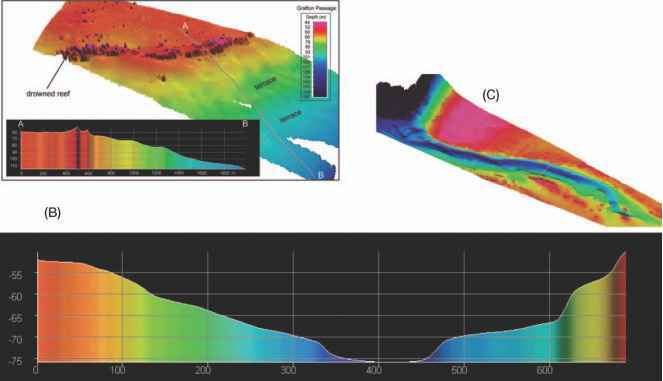 Recent investigations by marine geologists using multibeam echo sounders have revealed that drowned reefs extend for hundreds of kilometres along the GBR outer shelf edge in —40 m to —70 m depth. They appear to be submerged 'barrier reefs' approximately 200 m wide and are comprised of two parallel ridges of eroded limestone pinnacles (Fig. 3.3A). These drowned shelf-edge reefs might be an important archive of past climate and sea level changes, and potentially provide predictive tools for GBR coral community response to future climate changes. It is now also possible to map shelf depth palaeo-drainage in greater detail than ever before (Fig. 3.3B). Very recent work has extended the occurrence of these submerged shelf-edge reefs as far south as the northern end of the Swain Reefs. In previous decades the inherent difficulty of remote underwater exploration has restricted the usefulness of this work. A submarine terrace might represent a constructional feature—an interstadial reef—but it might also represent an erosional feature—a wave cut cliff or bench. Modern acoustic techniques involving multibeam sonar hold great promise for finally illuminating the inter-reef and shelf-edge stories by combining high resolution 3-dimensional structure with an ability to map its regional extent. mode. By contrast, steeper gradients, seen in the steep drop-offs on the GBR Ribbon Reefs and in atoll settings, are more like dipsticks, where the shoreline recedes little during sea level rise and environmental gradients are steep, narrow and less dynamic. A further consideration influencing reef development is the effect of sea level when still stand is achieved. Rivers that flow across the continental shelf during ice ages have their floodplain sediments remobilised during the next transgression. These materials are moved inshore by the wave climate and end up, in the eastern Australian case, coming onshore in spectacular dune fields. Geological studies of a dune island barrier system enclosing Moreton Bay, southern Queensland, showed that when sea level rise stops, the onshore movement of sediments into the near-shore sediment profile slows and coastal dune building decreases in size and extent. In the Moreton Bay example a few thousand years of still stand also led to the development of sedimentary deposits (coastal plains and tidal deltas) and their inshore environmental correlates (mangroves, seagrasses etc.). This restricted back-barrier circulation increased the estuarine nature of these environments with negative consequences for mid-Holocene back-barrier coral communities. In the Moreton Bay example many millions of tonnes of coral carbonate was deposited throughout the entire bay in sequences up to 8 m thick immediately after sea level stabilised between 6 ka and 4 ka. So extensive were these deposits they supported a dredge mining operation for over six decades. While corals are still found in Moreton Bay today the reduced circulation and increasingly estuarine conditions experienced after 4 ky has reduced their extent, growth and diversity. These corals are of interest to the GBR context for what they are not as much as for what they are. They did not form 'reefs' according to the 'wave resistant structure of organic origin' definition. Rather, the corals were flourishing mounds or banks of corals in a back-barrier setting with open circulation. Unpublished radiocarbon dates from Moreton Bay show these Acro-pora dominated coral communities (~40 spp.) grew and accumulated carbonate at rates of up to 5 m ky"1, similar to those known from GBR reefs. The Moreton Bay back-barrier model for coral communities is therefore a diverse, fast acting and geologically significant vehicle for corals over time. A significant difference between these communities and true reefs is that if sea level had continued to rise, these uncemented carbonate deposits would most likely have been eroded away. Further instances of coral communities from turbid environments forming detrital mounds (as opposed to 'true reefs') have been documented from near-shore reefs of the GBR, including Broad Sound and Paluma Shoals. We feel it is helpful to differentiate these 'coral communities' from 'coral reefs' because they provide an alternative phase during the 'life cycle' of the GBR. As sea levels rise and fall, barrier islands will form in response to still stands providing for Moreton Bay-style opportunities again and again. From a palaeoecologi-cal perspective they are a useful alternative to the high sea level reef paradigm. Having discussed the geological boundary conditions and some of the processes that frame the GBR in space and time we can now better understand our notion of a single interglacial to interglacial 'life cycle' of the GBR and also better scrutinise some of our assumptions about the system. A review of the drilling data shows that the majority of framework growth associated with the current interglacial GBR grew between 9 ka and 4 ka—5 ka window at depths shallower than 30 m. If we assume a similar window for the previous interglacial GBR then the extensive matrix of high sea level platform reefs we know as the GBR was probably active for about 10% of the ecological time between the last two interglacials. Moreover, it may only have been actively growing for about 5% of that time. A model of the GBR in time and space also needs to account for environmental gradients. Today, there is no single locality that supports all of the roughly 400 coral species found in the GBR region. Richest reefs are in the far northern to central region. Areas like Princess Charlotte Bay, the Palm and Whitsunday Islands provide important ecological space for 'inshore' or turbid water coral communities. These communities collectively contain most species present in the GBR coral fauna, with only a small pool of species apparently restricted to offshore reefs. There are, nevertheless, substantial differences in species' abundance in respect of the major environmental gradients, resulting in more or less characteristic community types across and along the GBR. In particular, there are major differences in species composition between the wave washed, clear water reef crest communities of the seaward slopes of outer barrier reefs and their highly sheltered, turbid water, inshore counterparts, most notably those of the deeper reef slopes of leeward sides of continental islands. These communities are at opposite ends of the physico-chemical spectrum and environmental gradients for the GBR. So do wave resistant high-stand reefs adequately represent a model for the ecological and geological propagation of the GBR in time and space? Clearly, only partially. If sea level were to fall by 10 m, 20 m and then 30 m would the corals of the GBR, and the thousands of coral connected species, go charging out to the Queensland Plateau to form a clear water 'reef'? Again, probably not. Just as understanding the workings of the modern GBR benefits from a wider whole-of-system approach, grappling with the GBR in time and space requires a broader conception of coral communities than just the clear water platform reefs where we might prefer to go diving. ■ WHAT CAN WE LEARN FROM PALAEOECOLOGICAL RESPONSES IN ANCIENT REEFS? Like tropical marine communities throughout the world, the corals, coral communities and coral reefs of the GBR are fundamentally influenced by their response to climate change and associated environmental parameters, including magnitude and rates of sea level change, CO2, temperature, and turbidity. There is a growing recognition that the integration of palae-oecological and climate data on the GBR provides essential insight into how natural communities are assembled and structured in the face of environmental variability over extended periods of time. Given our ability to discriminate among the various kinds of coral and reef development on the GBR, we next consider some examples of the ecological dynamics of coral reef communities over long time frames. Although less true for the GBR, many reef organisms are sufficiently preserved in fossil sequences around the world as to provide generic or even species level information on community structure, including corals, molluscs, echinoderms, coralline algae, and foraminifera. We will discuss these examples to help illustrate what the long term ecology of GBR reefs might have been. In the Indo-Pacific, recent evolution of corals has been rather slow, with less than 20% of new taxa appearing in the past 2-3 My. In the Caribbean, only two species have gone extinct in the past 125 ky As such, palaeoecological patterns from Quaternary reefs (past 1.8 to 2.6 My) can be investigated from what are essentially modern faunas. For example, during the last interglacial (128-118 ka), sea level was two to six metres higher than present levels. This has left a fossilised remnant reef in a large number of locations through the tropics (Fig. 3.2D), giving global insight into the ecological nature of reefs in the recent geological past. One of the best archives for understanding the ecological effects of sea level fluctuations on coral reefs is contained in Pleistocene reef sequences from several tec-tonically active sites around the world, the most famous of which is the Huon Peninsula in PNG, where nine such reefs were developed between 125 ka and 30 ka (Fig. 3.2B). This series of coral reef terraces, formed by the interaction between Quaternary sea level fluctuations and local tectonic uplift, allows investigation of the assembly of coral reefs during successive sea level rises. Here, ecological trends over millennial time scales point to high levels of persistence in community structure, regardless of the magnitudes of change in environmental variables. In the Caribbean, similar coral community structure was noted among four reef-building episodes ranging in age from 104 ka to 220 ka on Barbados. Remarkably, the high similarity in community composition derived from surveys of common species was also characteristic of separate surveys targeting rare taxa. These studies point to persistence in coral community structure over successive high sea level stand reefs that grew optimally during rising sea level, and are consistent with the rare glimpses we have of the GBR that also show that recurrent associations of coral reef communities are the norm (Fig. 3.4A). Current concern over the deteriorating condition of coral reefs worldwide has focussed intense attention upon the relationship between past 'natural' levels of disturbance and community change versus modern human-induced agents of decline. To understand the impact of humans our only recourse is to study the fossil record. The uplifted Holocene reef at the Huon Peninsula, PNG, age-equivalent to the GBR, has been studied to determine the frequency of disturbance in fossil sequences with little or no human impacts. Rates of mass coral mortality were far lower (averaging one in 500 years) than are presently being experienced in living reefs (multiple events per decade) (Fig. 3.4B). Recovery from disturbance was swift and complete, and the history of communities provides predictive power for the nature of their recovery. The stark contrast between living and fossil reefs provides novel insight to the abnormally high disturbance frequencies now occurring. 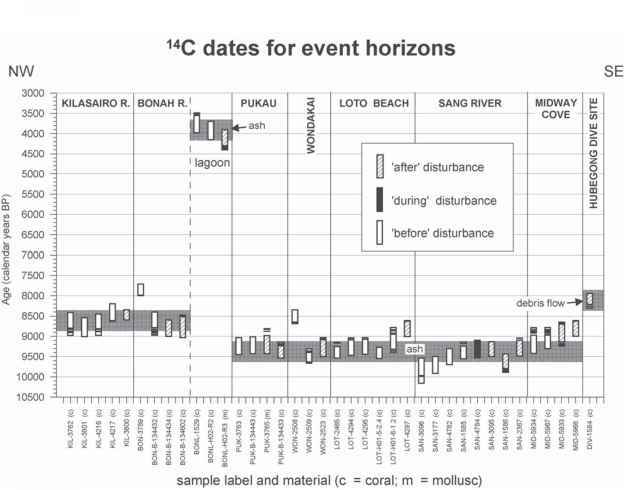 Figure 3.4 (Continued ) B, 14C dates of coral mass mortality along 27 km of the Holocene raised reef terrace from the Huon Peninsula, PNG. Two widespread disturbance events were dated at —9100-9400 years BP (before present), and ~8500 years BP. Isolated examples of coral mortality were observed in the Bonah River lagoon, and the Hubegong dive site. Mortality events are shaded, and labelled with their likely cause where this has been deduced ('ash', associated with a volcanic ash layer, or, 'debris flow', associated with a submarine debris flow). Shown here are the 2 sigma age ranges in calendar years BP (from Pandolfi et al. 2006). sequences of drowned coral reefs occur at significant water depths in Hawaii and the Gulf of Papua. Although the scale of resolution is much less for these drowned reefs, the overall picture is one of community similarity through large intervals of geological time. When sea level falls and a new reef grows, there is a high degree of predictability in the coral composition of the reefs. Global environmental change has had a profound influence over the development of tropical coral reefs since time immemorial, and their effects are no less profound for the GBR. Coral growth culminating in today's GBR has been shaped by the natural variations in sea level, temperature, CO2 and other climate variables that control light levels, rainfall, turbidity and ocean acidification. It is no wonder then that the ecology of coral and coral reef communities must be seen as dynamic and fluid in their response to Pleistocene sea level and climatic fluctuations. 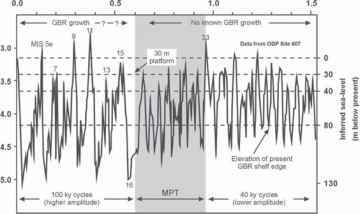 During the last interglacial to interglacial cycle the GBR has experienced large scale platform reef accretion during two short intervals near the peak of each transgression. However, for more extensive periods the GBR has been doing 'something else', including intervals of restricted shelf edge fringing reef development on the eastern slopes coupled with other non-reefal modes of coral community exploitation of the southern regions of the GBR province during the regressive and glacial intervals. Further work into the comparative response of coral communities and reef growth to these two end member phases should provide important insight into prediction of reef response to future climatic changes. Now the GBR, like many coral reefs around the world, is changing dramatically in response to human interaction. But living ecological systems provide few clues as to the extent of their degradation. The only recourse into understanding the natural state of living reefs is the fossil record. Our knowledge of past ecosystems on the GBR contributes to formulating sound approaches to the conservation and sustainability of the GBR; specifically in ensuring that policy makers and managers use geological contexts and perspectives in setting realistic goals and measuring their success. Beaman, R. J., Webster, J. M., and Wust, R. J. A. (2008). 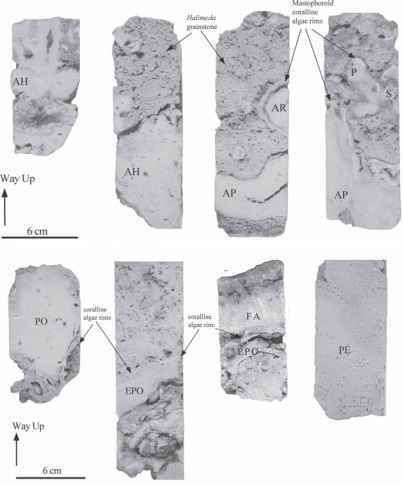 New evidence for drowned shelf edge reefs in the Great Barrier Reef, Australia. Marine Geology 247, 17-34. Chappell, J., Omura, A., Esat, T., McCulloch M., Pan-dolfi, J., Ota, Y., and Pillans, B. (1996). Reconciliation of late Quaternary sea levels derived from coral terraces at Huon Peninsula with deep sea oxygen isotope records. Earth and Planetary Science Letters 141, 227-236. Lambeck, K., Esat, T. M., and Potter, E.-K. (2002). Links between climate and sea levels for the past three million years. Nature 419, 199-206. Larcombe, P., and Carter, R. M. (2004). Cyclone pumping, sediment partitioning and the development of the Great Barrier Reef shelf system: a review. Quaternary Science Reviews 23, 107-135. Pickett, J. W., Ku, T. L., Thompson, C. H., Roman, D., Kelley, R. A., and Huang, Y. P. (1989). A review of age determinations on Pleistocene corals in eastern Australia. Quaternary Research 31, 392-395. Webster, J. A., and Davies, P. J. (2003). 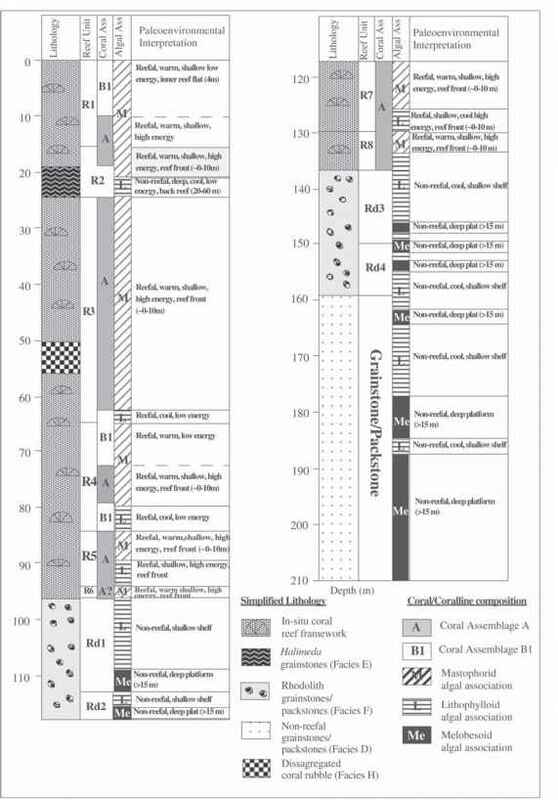 Coral variation in two deep drill cores: significance for the Pleistocene development of the Great Barrier Reef. Sedimentary Geology 159, 61-80. Pandolfi, J. M., Tudhope, A., Burr, G., Chappell, J., Edinger, E., Frey, M., Steneck, R., Sharma, C., Yeates, A., Jennions, M., Lescinsky, H., and Newton, A. (2006). Mass mortality following disturbance in Holocene coral reefs from Papua New Guinea. Geology 34, 949-952.